This year marks the tenth anniversary of Old Henry, a house blend made for Holt’s Cigar Company by none other than José “Pepín” García. Holt’s, as you may know, is the Philadelphia tobacconist that launched the Ashton brand in 1985 and today maintains a strong catalog and online presence. That means you don’t have to traipse to 1522 Walnut Street in downtown Philadelphia to get your hands on some Old Henry smokes. It’s probably no surprise, then, that the Old Henry portfolio has grown over the years. Additions have included Gold Label (Connecticut-seed Ecuadorian wrapper), Maduro (Connecticut Broadleaf wrapper), and the subject of today’s review: Pure Breed. I sampled two Pure Breed Toros for this review, both of which were provided to me by Holt’s. This format costs $6.50 for a single or $93.95 for a box of 25. It boasts a clean, attractive wrapper with tight seams and minimal veins. The pungent pre-light notes are sweet hay and cocoa powder, and the cold draw has a fair amount of resistance. Once an even light is established, right off the bat you’ll find a hearty dose of red and black pepper with some creamy sweetness and roasted nuts in the background. Marshmallow, dry oak, and dried fruit are apparent through the retrohale. The abundant resting smoke is sweet and aromatic with a mouth-watering chocolaty appeal. As the Toro progresses, there short spurts when the taste turns light and papery. Just when I think the flavor is fading, though, I’ll happily find a burst of creaminess and sweetness to pique my attention and enjoyment. The finale ushers in a reprise of Pepín’s signature blast of pepper. Construction is pretty good throughout. Both samples exhibited fairly straight burns that only required a touch-up here and there. The ash holds well. And the draw, while a bit stiff at first, opens almost immediately to provide abundant smoke with easy puffs. If you’re a Pepín fan, you can’t afford to not give the cigars in the Old Henry portfolio a try. I doubt any of them will knock your socks off with incredible complexity, but the bang-for-your-buck value is tough to beat. 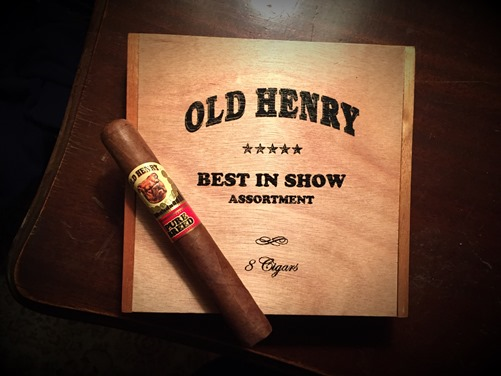 My advice is to pick up the Best in Show sampler, which features two Toros from each of the four Old Henry blends for just $29.95 ($3.74 per cigar). The Pure Breed Toro might be the highlight of the assortment, with its abundant flavor and sweet creaminess. In my book it earns a solid rating of three and a half stogies out of five.